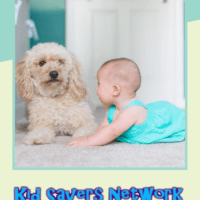 A baby gate is usually top of the list when parents think about baby-proofing their home. Retractable stair gates offer a lot of advantages over fixed designs. They are great for “high traffic areas” like the bottoms of stairs, dining rooms, and kitchens. 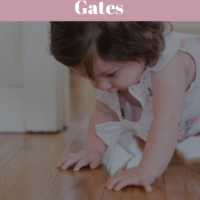 They’re also great for extra wide or narrow spaces that a regular-sized baby gate won’t cover. A retractable gate doesn’t leave a big metal bar for you or your kids to trip over, either. Unfortunately, there are not many baby gates that retract on the market. The number that parents actually recommend is very small indeed. 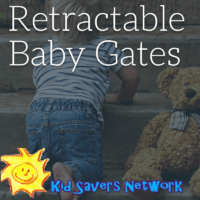 On this page, you’ll find our reviews of the best retractable baby gates. The Lascal KiddyGuard Avant retractable baby gate is a great alternative to cumbersome traditional gates. The Avant’s stylish Swedish design helps it blend in with almost any room. The gate fully retracts so it’s out of the way and there’s no danger of tripping. Lascal state that the gate can take 220lbs of pressure so it can contain even the strongest toddler (or two!). Getting a traditional gate to comply while holding your baby can be an Olympic task. So we can really appreciate how easy they’ve made this gate to open – even with one hand. And it’s just complicated enough to stop a toddler from working it out, too! Additionally, the Lascal KiddyGuard can be installed on nearly any opening. It is important that the gate fits flush with the installation surface. Setting the gate at any angle will compromise its functioning. This gate doesn’t have to stop our feline friends in their tracks, either. The material has just enough give to it that placing it 3 to 4 inches off the ground will keep access to the litter box safely unobstructed. There’s also an indicator letting you know when it’s locked. One negative point some buyers have noted is that the installation does take some time. This gate cannot be simply dropped in place. But most reviews have been favorable and for the price, this is a great retractable baby gate. 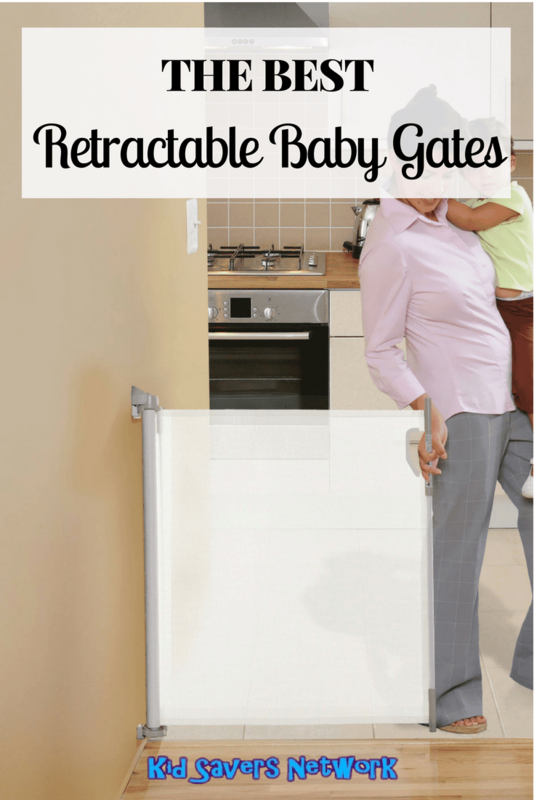 The Retract-A-Gate is perhaps the most well-known retractable baby gate on the market today. It’s also one of the few that is JPMA Certified (Juvenile Products Manufacturers Association) for use at the top and bottom of stairs. The standard size is 52″, but there’s also an extra-wide 72” one available, too. This means the Retract-A-Gate will cover even the widest spaces in your home. If you’re looking for an extra-wide baby gate – this is it! The Retract-a-gate is designed to be used and locked with one hand. This is good news for us parents who often carry our babies from one room to the other single-handedly. Pet owners also love it. It’s tall enough that most dogs and cats are deterred from trying to jump over. The manufacturers have pressure tested it to withstand over 200lbs of force – so it’s very strong! It can also be used outdoors with many buyers using it solely on their decks. It’s also made from high quality, strong materials. The mesh is scratch resistant and will last years even under heavy use. 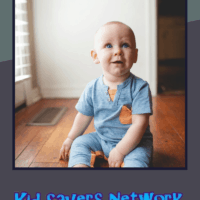 The childproof locking mechanism helps prevent toddlers from unlocking it. However, some parents have said their older children were able to unlock it. Another concern is that if not properly fastened the younger children may be able to crawl underneath. So it’s very important to double check that the gate is securely locked. In conclusion, this is an award-winning, extra wide baby gate that parents love. You can find the latest price here. The Gaterol Active Lite is a retractable baby gate with style. Its strong, durable and at 55″ by 36.6″ it’s extra wide and extra tall, too! Many parents have raved about the Gaterol’s one-handed quick release. They have said that it can be easily fastened using one hand with a little practice. This is essential for when you need to things quickly and are carrying your little one! This gate attaches firmly to the wall with screws. Unlike with traditional designs, even strong toddlers are incapable of shaking the Gaterol loose. In fact, owners with large, strong dogs have reported that the gate stands inviolate facing even the most determined canine assaults. Another great feature is that the gate is designed for outdoor use. This makes the Gaterol perfect if you need a baby gate for a porch, or the steps down to your back yard. A potential negative reported by some is moderately difficult installation. In particular, if wainscoting or tall molding is present additional spacers may be required. The gate must not be installed at an angle. The Gaterol Active is currently available in a double pack at a great price. This Summer Infant retractable baby gate is designed for one-hand use, making it easy to open and lock when carrying a baby. The mesh barrier takes on an almost steel-like hardness when locked in place. This means dogs as large as 100 pounds will be contained and it has no trouble stopping young toddlers. Many dog owners say it stands up well to their furry friends pawing at it, too! At 50″, it also high enough to prevent most cats. 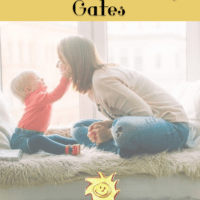 All in all, this Summer Infant gate is a great way to contain pets. The instructions are clear and installation is easy. It’s recommended that the gate be screwed into a wall stud if possible. Some reviewers have expressed doubts about the anchors that ship with the gate. The anchors are meant to be used on pure drywall if a stud is not available. But it may be advisable to go with larger anchors to ensure that stresses put on the gate don’t damage fragile drywall. Unlike some similar items, this Summer Infant Gate ships with all mounting accessories. It should be noted that his design is not intended to be mounted directly to stair banisters. However, multiple tutorials can be found on Youtube and elsewhere if the need arises. You do need to know that this gate is not weathertreated, so it can not be used outside. At this low price point, it could be the best retractable baby gate for the money in 2018.